Makes perfect sense. Keep bike-share at bay, and the neighborhood can be suspended in time. David Greenfield and the MTA won’t mess with F train service. Supermarkets will stay in business. The meddlesome construction of housing for other people will cease. Traffic and parking will return to a state of perfect efficiency. Or maybe, in this majority car-free neighborhood, bike-share is going to help people affected by less frequent F local service (if that ever happens), improve access to grocery stores beyond a short walking distance, and ease traffic troubles a bit by making it more convenient to get around without driving — and whoever made this flyer just wants to maximize free curbside parking spaces on Degraw Street, where the author stores a personal vehicle. Bike-share NIMBYs tend not to get very far in NYC, but if you live in these parts it can’t hurt to dial up Council Member Carlos Menchaca’s number on the flyer and say you want a robust bike-share system for the neighborhood. It’s always amazing to me that parking is frequently described as “valuable” or “precious.” If that’s the case, why is it free? That was my thought exactly! If it’s so valuable, then pay for it at free market rates. 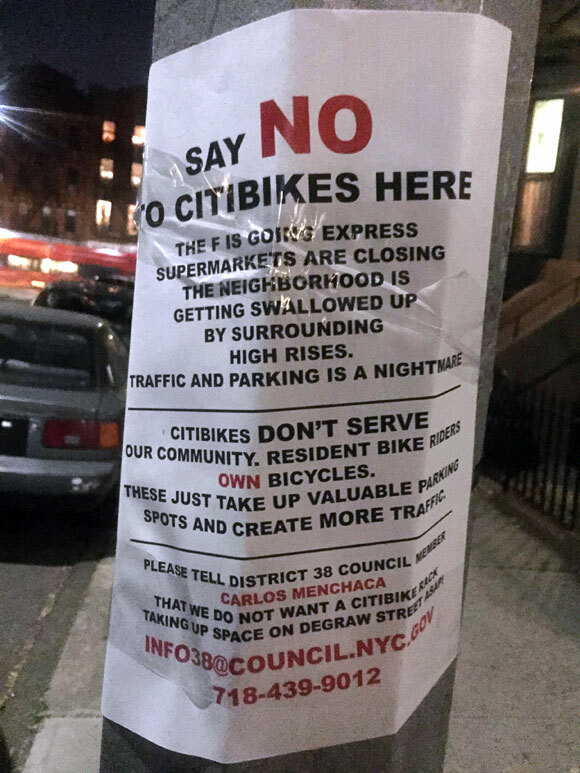 Please call or email Carlos Menchaca that a crazy person is putting up flyers full of lies and that Citibike is part of the transportation network. Also: let him know that taking away a parking space or two will not make Cobble Hill turn into Transylvania. Make sure to cc: The Bike Lobby. People may want to do a public service and take down those flyers if they see them. It’s illegal to put flyers on lamp posts, trees, bus stops, etc…, and helping maintain law and order by removing the sign would be a solid act of citizenship. Why does a significant portion of the population want to make NYC a time capsule? Yes, things change, sometimes for the better, sometimes not. That’s part and parcel to living in a big city. If you want to live somewhere which is pretty much the same when you’re 80 as it was when you were born a small town might be more your speed. And parking? Is this all these people care about? The single most monumentally stupid thing NYC ever did was to allow overnight curbside car storage in the first place. If you want to have a car in a large city, you should have a place off public streets to store it. I mean, at the end of the day, we’re dumb animals, and I think all dumb animals instinctually fear change. Kind of like how a dog acts all nervous for a week or so when you move a couch to a different place in your livingroom. Beat me to it. Red Hook is the only part of Menchaca’s district in the expansion zone. Right, it’s Lander’s district. Very strange. Because capitalism is for other people, silly. Meh, not enough exclamation points. #Fail. If parking spots are so “valuable,” maybe we should figure out a better use for them than simply a place for the free long-term storage of people’s private property. Well there’s a testament to the affluent Brooklyn mindset. But you’ve got to admit that they nailed it with the CAPS-LOCK, the variety of font sizes and colors and connecting the advent of bike-share with the closing of supermarkets and the swallowing up of the neighborhood. For a #bikelash scare-mongering lamppost flyer, I’d give this a B, maybe even a B+. Definitely loses some points for lack of exclamation points and no egregious misspellings. How much pot did you have to smoke before coming up with that mind-blowing insight? The good news is that someone who doesn’t know who his or her elected representative in the City Council is probably doesn’t have much chance of mounting a truly organized opposition campaign to one bike share station. Citibikexit referendumb! Who’s with me? the foaming at the mouth hatred Many Drivers Have for people cycling is a wonder to behold. It’s some deep pathology. Parking lots so valuable they can be used free of charged. There’s going to be a station at the Trader Joes at Court and Atlantic. So, what was a 15-20 minute walk, is a 4 min cheap ride away. It’s such a no brainer. Excuse me. I pay a car registration fee! So “Citibikes don’t serve our community. Resident bike riders own bicycles.” Then how come my family of four, with seven bikes among us, has taken ~750 Citibike trips since Day One? And I pay taxes on the alcohol I buy! That means I am ENTITLED to get drunk and vomit all over public spaces. Dude. But seriously, that’s a good line. Ridiculous! I am a Cobble Hill resident, born and raised, and I own a bike AND use citibike. I would LOVE to have citibike on our side of Atlantic Avenue. I am so tired of the NIMBY attitude in Cobble Hill!! The sign implies that locals don’t need Citibikes, and that they all have their own bikes. Then how are the Citibikes going to increase traffic? Always be wary of anonymous flyers. It generally means the author is acting on his/her own, is venting, doesn’t fully believe in his own convictions, or is just plain nuts. The F express plan is a bad idea, but that’s just this sign’s being a good example of a broken clock being right twice a day. Don’t muddy the real issues with pesky facts and evidence! One person with a roll of tape and a bunch of badly printed signs does not a community opinion make. Not to go off topic but Cobble Hill has at least 3 supermarkets including an “affordable” Key Food on Atlantic. Plus end-to-end the entire neighborhood can be walked in less than 10 minutes and AFAIK there are no high rises going up in the neighborhood proper. So this person might need to settle down a little bit. Funny, I had the exact opposite reaction when I took a Citibike down there to meet a friend. Had to double back up to Atlantic. this bird brain doesn’t imply this, they state it as fact. ive got more than one bike, but by no means do i assume that others can afford the money or space for them. where does it come from? why are some people AGAINST simple, sensible, sustainable change? who are these people and in what culture were they raised? I lived on Montague street for 5 years so I know the culture – i just dont get why they think citibike is a bad thing. you gave up the backpack? for shame. all you have to do is NEVER take the backpack off and nobody will see your stains. i didnt see you! you are not supposed to be in the lane! nah, thats new brooklyn. maybe the times have passed me by (nyc born 1983 – and lived in Brooklyn Heights for 5 years) but these transplants are changing their section of the landscape, not redefining the whole borough. like public gardens that grow food for the worlds hungry? i pay for those public spaces too and your personal use of them as a toilet infringes upon my quality of life! your vomit, NIMBY. In all seriousness, just keep it on the curb near a storm drain.